Because spring is officially here. What do you go to the supermarket for? Produce? Canned goods? The opportunity to judge the cart of the person in front of you at checkout? Well, if you live near a Lidl, there’s now a new reason to head to the grocery store: The affordable European supermarket is launching a spring gardening line. For five weeks, you can get a range of plant-related paraphernalia at all US Lidl locations while supplies last. Six products in total—some in different sizes and assortments—will be filtering out through the end of April. According to Lidl’s director of communications Will Harwood, the decision to branch out (sorry) into gardening is part of the brand’s efforts to offer seasonal products. The gardening campaign officially launched March 22. However, the full line of products is now available as of today, April 8. Ranging in price from $1.99 to $39.99, the entire collection is super affordable, and a great way to bring in a pop of greenery to your home—whether or not you actually possess a green thumb. The line kicks off on the low-maintenance end of the spectrum with cactus-shaped candles, available in tiny pots meant to resemble tin cans and stone planters. $3.99 will get you a ceramic plant in either one large size, two medium sizes, or three small sizes. Feeling a less traditional way to store your plants than inside a planter? Try either a mason jar or paper bag—for $4.99, you can get a decorative plant in either innovative vessel. The bag of lavender is particularly chic; plus, it’s an easy way to update your desk decor. Lidl is also offering three different ways to display your greenery. A faded green wood plant stand comes complete with a chalkboard for a personalized message, and folds for easy storage in the event you commit involuntary plant slaughter and kill your new floral friends. 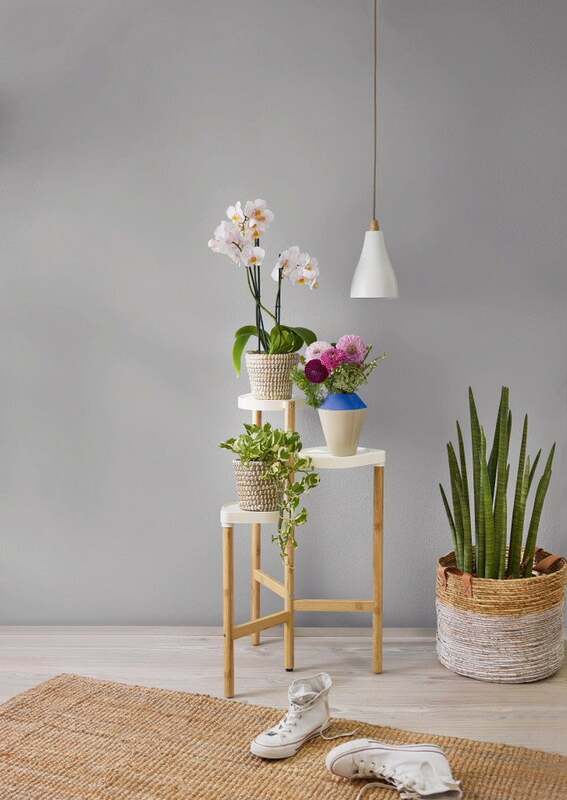 A three-tier plant stand ($29.99) and a ladder with pots ($39.99) round out the collection, emulating a sleek minimalist aesthetic with their simple design. Pick out one plant stand and fill it with your favorite blooms—which, conveniently, you can also find in this new collection. The gardening line isn’t the first time Lidl has reached out into non-food related products. In October 2017, the retailer launched a limited-edition line of uber affordable (seriously, everything was under $25) furniture. And according to Harwood, the company isn’t slowing down anytime soon—they’re already exploring new ventures to bring to customers in the future. “Keep an eye out for our notes! Lidl takes great pride in listening carefully to our customers, constantly searching for great new products and emerging trends, and using those insights to deliver new products and promotions that are exciting for our shoppers,” he says. Check out this map to see if there’s a Lidl store near you.